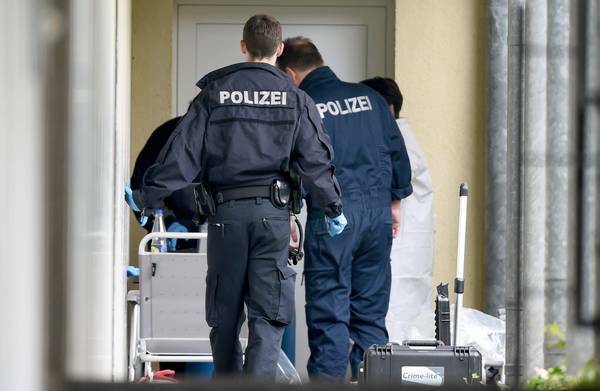 (ANSA) – BERLIN – The bomb experts of the German police found in an Islamic couple’s flat – both were arrested in late April in Oberursel, near Frankfurt – was filled with nails. The news is reported by the German weekly ”Der Spiegel”, underlining that the bomb would have killed many people, if it had been detonated even at some distance from where it exploded. The arrested couple – a Turkish-German man, 35 yo, and his Turkish wife, 34 yo, parents of two children aged 2 and 4 – allegedly planned to explode the bomb along the bike route of a cycling race for professionals and amateurs scheduled for May 1. For security reasons, despite the arrests, the local authorities had imposed the cancellation of the race: it was still unclear whether some accomplices would be ready to strike again. In the flat seized by police, in addition to the bomb, parts of an assault rifle, ammunition, chemical agents and 24,000 euro were found. The arrested man’s father, interviewed by Der Spiegel, has reacted with ‘incredulity’: according to him, his son had urged him to go more often to the mosque, but he did not have any warning sign. ”He has a happy family, happy children, he used to attend the mosque. Why should he put his family’s happiness at risk?”, the man said. (ANSA). To STOP the islams !!! • Remove “Our Authorites” who are really islamoamourers ! – The islamoamouring “Our Authorites” will continue being TRAITORS AND SEDITIONERS to you and me – the Civilised !!! islam is a lie !!! Just the usual Vile Putrid Malevolent Deceitful islam savage !!! Just so you know how to treat the islam in Your Life !!! Agreed. When such “Authorities” lie to the public about not understanding the “radical” (fundamental; root) causes of Jihad (i.e: the Qur’an, islam) they are acting as willing criminally negligent accessories enabling those muslim crimes!